The area between the Pioneer Mountains and Craters of the Moon National Monument encompasses a large expanse of sagebrush ecosystem that is vitally important to sage-grouse and other wildlife. Photo by Pioneers Alliance. Stretching from Sun Valley to Arco, Idaho, the Pioneer Mountain region encompasses high mountain peaks, river valleys and sagebrush steppe that supports a rich variety of wildlife and some of the best remaining sage-grouse habitat in Idaho. Sage-grouse inhabit the lower elevations of this relatively un-fragmented landscape. Covered with sagebrush, crossed by clear streams, and dotted with lush wet meadows, this area is key habitat for grouse. In recent years, sage-grouse habitat has dwindled across the West. But in central Idaho, a collaborative effort is generating willingness to preserve habitat for the at-risk bird. Landowners in the Pioneer Mountains region formed a strong partnership with conservation organizations like The Nature Conservancy and Wood River Land Trust, and agencies, including USDA’s Natural Resources Conservation Service (NRCS), to safeguard wildlife habitat and protect the ranching way of life. Conservation easements are the cornerstone of their endeavor. Moist meadows offer a range of food choices for grouse: flowers, leaves, buds and insects. Photo by Bill Mullins, Wood River Land Trust. The land in the region compose a mosaic of privately owned and public lands, including 160,000 acres of working farms and ranches. This agricultural land provides a vital link connecting public lands to the north and south. 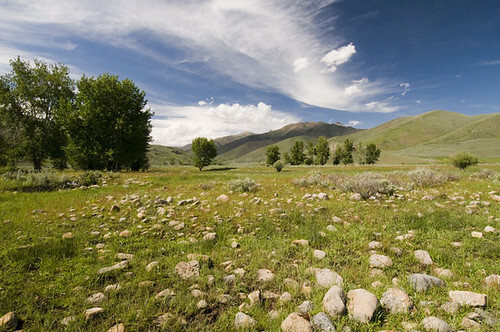 Voluntary conservation easements are helping connect public lands to create a contiguous swath of habitat while protecting working farms and ranches that contain vital sage-grouse habitat. Twenty-six landowners have enrolled 38 ranches in conservation easements supported through funding from Sage-Grouse Initiative (SGI), a NRCS-led partnership. These permanent easements protect more than one-third of the private acres in the region and connect wildlife habitat to almost 2.4 million acres of public lands. Conservation easements purchase future development rights and landowners are required to follow a grazing plan to protect and improve sage-grouse habitat. “The work in the Pioneers is one of the finest examples of locally led conservation that I’ve had the privilege to be involved with. It is something that will be on the landscape forever,” said acting State Conservationist Travis Thomason. SGI, launched in 2010, aims to achieve wildlife conservation through sustainable ranching. The goal is to keep the declining sage grouse off the endangered species list by conserving and restoring the bird’s strongholds across 11 states across the West. So far, NRCS and SGI partners have worked with private landowners to restore 4.4 million acres – an area the size of two Yellowstone National Parks. In the past five years, NRCS has invested $296.5 million to restore and conserve sage-grouse habitat. Last week, NRCS announced its plans to extend these efforts by about $200 million over four years. 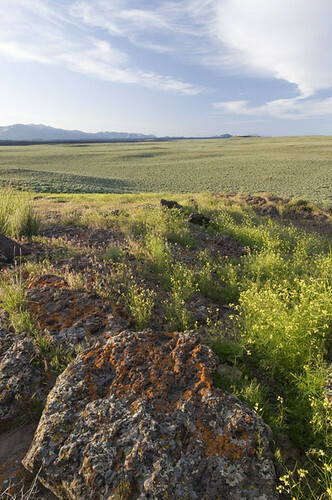 This area, known as the Pioneers-Craters landscape, has been identified as a conservation priority in Idaho by numerous studies, planning efforts and conservation organizations. Photo by Bill Mullins, Wood River Land Trust.